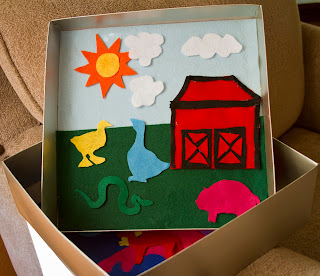 Glue a piece of felt onto the inside of the lid of a small box. Shoes boxes and Nordstrom boxes work great. Make felt cut outs of animals, scenery, or whatever you choose for storytelling or for play. Then store the cutouts inside the box when not in use.